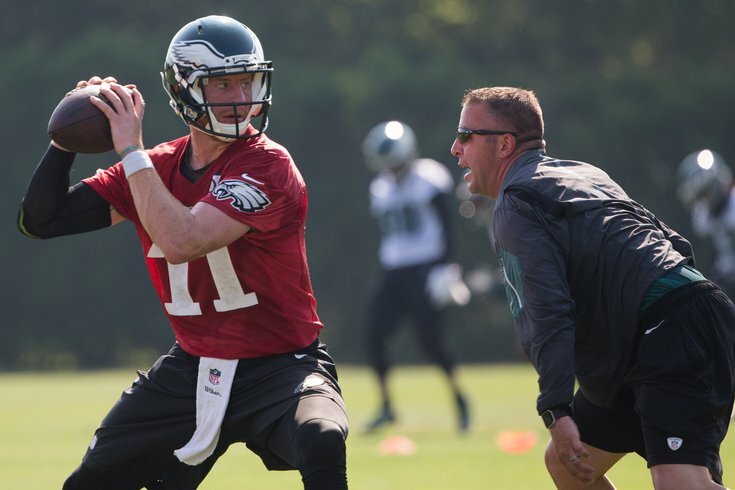 Former Philadelphia Eagles quarterbacks coach John DeFilippo runs drills with quarterback Carson Wentz. Carson Wentz and Nick Foles will be playing for a new coach next season – well, a new position coach anyway. On Thursday, hours after the Eagles paraded down Broad Street to celebrate the city's first ever Super Bowl, reports began to surface that the Minnesota Vikings had hired quarterbacks coach John DeFilippo to replace Pat Shurmur as their offensive coordinator. Shurmur, who spent three seasons as the Birds' OC under Chip Kelly, was recently named head coach of the New York Giants. Hours after the Eagles wrapped up a day of celebration with their Super Bowl victory parade, Philadelphia quarterbacks coach John DeFilippo was hired by the Vikings to take over OC duties, a source confirmed to ESPN's Adam Schefter. A year ago, the Eagles blocked the New York Jets from interviewing DeFilippo, who went to Radnor High School. Over the summer, he was asked about whether or not that decision bothered him. And given that he's been hired away a year later – but not before helping Philly win its first Super Bowl – the answer he gave back in June looks pretty prophetic. Now, however, he's gone. But it's not like Wentz will suddenly be on his own – and while "Flip" played a role in the jump Wentz made from Year 1 to Year 2, he wasn't the only one. DeFilippo, who has a year of coordinator experience under his belt (2015 Browns), was part of the Birds' quarterback-focused offensive staff, along with former quarterbacks in head coach Doug Pederson, offensive coordinator Frank Reich and wide receivers coach Mike Groh. And that, combined with the success of the Eagles quarterbacks this season, likely meant an offensive assistant getting hired away was a matter of "when," not "if." One of the hottest names to be considered for a head coaching job this offseaon is DeFilippo, whose work with Wentz and the Raiders' David Carr has been widely recognized. Read any "2018 NFL head coach candidate" article, like this one by ESPN's Dan Graziano for example, and you'll rightfully find DeFilippo's name. The 2018 NFL Draft class is thought to be very deep and talented at the quarterback position. Simultaneously, it is believed by some that there could be seven or more head coach firings during or after the 2017 season. The New Giants have already moved on from their head coach, Ben McAdoo, earlier this week. The combination of those two factors are going to leave quarterback gurus with experience in demand. And it may not be done yet. Reich is reportedly set to interview for the Colts' vacant head coaching position, one that was thought to be filled before Patriots offensive coordinator Josh McDaniels backed out earlier in the week.